All your breakfast dreams are about to come true. One hour cinnamon rolls! Or brunch. Maybe brunch dreams. Because if we say brunch, then we can have cocktails without judgement and that’s just… super festive. Along with one hour cinnamon rolls, life would be made. If you’ve been reading for awhile then you know that I have a, well… complicated… relationship with eggnog. It’s no secret that I absolutely adore eggnog lattes. Especially iced. They are incredible and rich and decadent, but I also don’t want them past December, so having one month of them is perfection. Does this rambling make any sense? Since I was a kid, I loved having a few sips of eggnog every December – but only a few sips! Like a small glass is juuuuust right. It’s such a decadent drink and coming from someone who never loved milk growing up… eep. It can be a lot. However! In recent years I have been head over heels for eggnog-flavored things. This very week after Thanksgiving? I usually share an eggnog-based recipe and have done so for YEARS. So why change it up now? Eggnog based one hour cinnamon rolls are giving me life at the moment. I mean, I have your PERFECT Christmas breakfast right here. !!!!!! So, for the last few Christmases I have made the Pioneer Woman’s cinnamon rolls a day or two ahead of time and given them to people to have on Christmas morning. They are easily some of the BEST cinnamon rolls I’ve ever had. They are slightly time consuming though, so a few years ago I started making a one-hour version. And this year, I made them with eggnog. And the DREAMIEST eggnog icing. Just look at that! This recipe is for when you… forget… that you want to make cinnamon rolls, or you wake up and want to make them immediately. They may not be a hugely fluffy as traditional ones that take a few different hours of rising, but they will still rise enough to taste DELISH. It’s the most perfect blanket of eggnog sugar that I ever did see. And the nutmeg specks! That’s what MAKES it. The best news is that you can even prep these the night before if you’re really feeling it and then just pop them in the oven in the morning. Cover them with the glaze, maybe serve with a shot glass of eggnog (+ bourbon?) and you will be the most popular person in your house. Forever! And you should certainly make an extra pan (or three) and pop them in the freezer for breakfast emergencies. You know, like right after New Year’s Eve orrrr the like. Maybe even for January. Be a rebel! Place the milk and butter in a small saucepan and heat over low heat just until the butter melts. Remove from the stovetop and let sit for 2 to 3 minutes, then stir in the water and vanilla extract. With the dough hook attached to your mixer, stir in the milk and butter mixture until combined. Add the salt, cinnamon and the eggs, one at a time, beating well after each addition. The dough will be very sticky! Add the remaining 3/4 cup flour gradually, beating for another 2 to 3 minutes until the dough comes together again. It should still be stick. Place it in a bowl and let it sit for 10 minutes. After 10 minutes, roll it out on a floured surface to a 14x10 inch rectangle (or something close to that!). Add the filling - add the melted butter on the dough. Whisk together the sugar, cinnamon and nutmeg and sprinkle it all over top. Starting with one of the long sides, roll it up tightly. Slice the roll into 1-inch cinnamon rolls. Place them in a baking dish - either a 10-inch round or a 9x9-inch square. Let them sit for 5 minutes. Bake the cinnamon rolls for 35 to 40 minutes, until golden brown on top. Remove and cover with the eggnog glaze. Serve hot! Whisk ingredients together until a smooth glaze forms. If it’s too thick, add more eggnog 1 teaspoon at a time. If it’s too thin, whisk in more sugar a few tablespoons at a time until desired consistency is reached. Isn’t that the most perfect cinnamon roll puff? This is my flavor. I would eat it with cappucino. Must be delicious taste. Interesting method for reducing time spent hydrating, resting, and fermenting down to 15 minutes. Does that produce something a little denser and less bread-y tasting than higher maintenance doughs, like the Pioneer Woman one you link to? Given the soppiness of eggnog — even artificial flavors engineered to taste like “eggnog” feel soggy on my tongue, such is the power of suggestion — that could be a very good thing. The glaze sounds delicious, especially if it’s topping something a little crunchier and less airy. I find pastry that has only a modest amount of leavening can stand up better to softer, plusher icings without turning into custard or pudding by the next day (and they’re more forgiving of over-baking, too). the rolls are slightly denser than ones that rise for a few hours, but they still get a good rise in! this looks like christmas morning on a plate!!! so, so yummy! I adore anything eggnog and aways make eggnog/cranberry quick breads for Christmas giving.These rolls look beyond delicious but I have a couple of questions. First…do you use rapid rise yeast and/or a specific brand? If one were to make these and refrigerate them for the next day, how long would they have to rise prior to baking? Most over night rolls require at least an hour but they also have a much longer initial rise. Thanks for any clarification you can offer! hi nancy! i just use regular active dry yeast – not rapid rise! i think if you made them and stuck them in the fridge the night before, you wouldn’t have to worry about leaving them out to rise at all! the only thing you might have to worry about is if you’re using a glass/ceramic dish that may need to come to room temp before being placed in a hot oven? This looks so fantastic! I like to use a touch of eggnog in my coffee, almost like a creamer! Then I get the eggnog taste with out feeling super full! Will definitely be making these bad boys! i do the same with my coffee! it’s the best! These babies are everything I want in Christmas Eve – also a great use for some eggnog when my sipping/adding to coffee hasn’t finished the whole bottle! I actually don’t love eggnog (ack, I know! ), but I am 10000% on board with these! B. WHERE can i get that cinnamon roll dish???? thank you!! i got it at pier one a few weeks ago! Oh my goodness! These sound/look incredible! Do you have recommendations for freezing and then baking after freezing? These sound dreamy! Thank you for such a great idea! Well hello there, lover! Are you kidding me with this flavor combo? I need this yesterday. 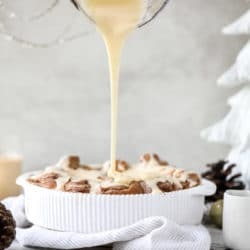 I love how delicious and gooey these look..but, I’m not an eggnog lover . 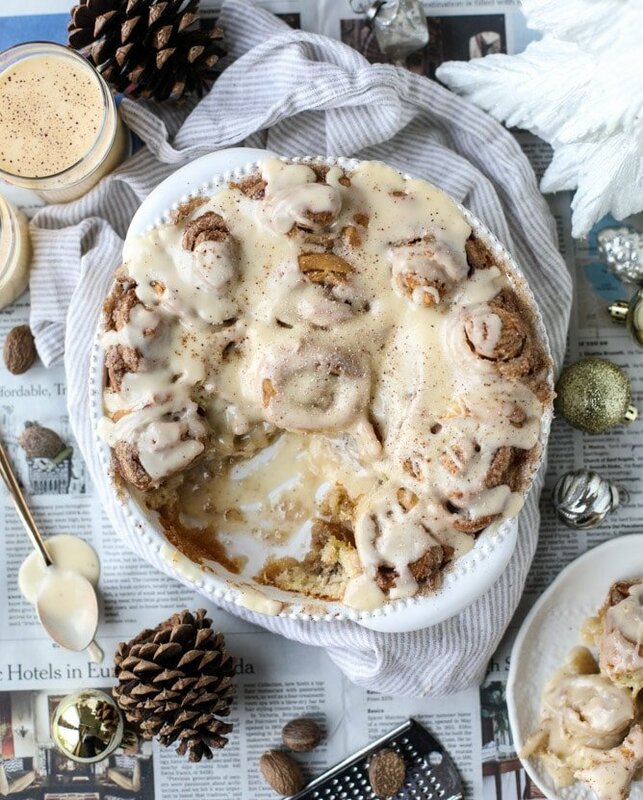 I’d like to make one hour cinnamon rolls for Christmas morning, could you suggest substitutions? Leave out the nutmeg? Milk instead of eggnog? In the second step it talks about mixing butter and milk but there’s no milk in the ingredients- does this mean eggnog?